Black and white acrylic on canvas, 8"x12". I painted this as a birthday present for a friend. 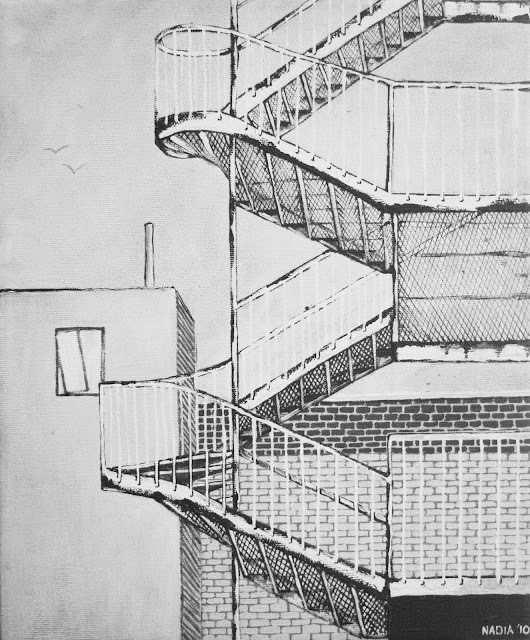 It is based on a photo I took of a fire escape in Montreal. Also, I received two beautiful paintings from friends for my recent birthday, and I thought I would include them here. Mixed media on canvas 6"x12" by Maya. Maya is my roommate, this an amazingly accurate portrait of the street we live on. You can see the CN tower in the background. Acrylic on canvas 6"x20" by Dusty.